Summary: ETC instruct that it is necessary as wide as possible to inform people of Earth about the beginning of global cataclysms and about necessity to make the Transition in the following life-cycle through synchronous association of consciousness before the second preliminary cataclysm. After it the quantity of people on the planet will be no longer sufficient to start the mechanism of the Transition and mankind will be perished in global cataclysms. Disasters will never stop because they are connected with destruction of planet and will intensify. Association of consciousness does not affect nobody's private property. The united consciousness possesses action which will transform our body. It is necessary for the Transition to other level of the material world. The united consciousness of mankind possesses very weak action. Only all civilization of Earth can cause the action, capable to transform our body. ETC prove that the mankind not informed in advance, shocked by power of the first preliminary cataclysm, would not be able to quickly restore broken communication links. A lot of precious time will be lost. Civilization can not manage to make the transition in time. Only the mankind warned in advance has a chance to make the Transition in time and to continue life. Dear crop circles researchers! This pictogram is an appeal of ETC personally to each of us with a big request – as soon as possible and more widely to extend this information. In this pictogram ETC prove that it is necessary to warn in advance our civilization about approach of global cataclysms and necessity of the Transition to the next life cycle. For this purpose, ETC show in pictogram two ways of the united consciousness formation necessary for the Transition - not informed civilization and in advance warned civilization. Caught off guard nothing understanding civilization can unite consciousness only in three stages. Already prepared civilization can unite consciousness in just two steps. The first way of unification of consciousness for an unprepared civilization begins with individual consciousness, i.e. from an everyday life. People of Earth know nothing about the beginning of global cataclysms of the planet destruction, so the first preliminary cataclysm catches them unawares. Invaluable time for restoration of broken links, informing and perception of the information, and also arranging the process of consciousness synchronization would be lost. ETC show that three stages is too long way, and a time interval between the first and second preliminary cataclysms would be too short. ETC warn that we may not be in time with the Transition. The second way is faster. It contains only two stages and allows winning time considerably. This way corresponds to informed in advance civilization which before the first pre-cataclysm already knows that for life prolongation it is necessary to form the united consciousness. In this case, our Transition will happen for sure. ETC underline that if we wait for the second preliminary cataclysm the destiny of civilization will be already resolved. It will be destroyed in global cataclysms. It will occur because after the second preliminary cataclysm the quantity of people any more will no longer be sufficient to start the mechanism of the Transition. It is necessary to notice that the symbol of a body transformation is put in the pictogram basis. These are the alternating radial dark-light strips which are crossing out area of a body because they are located between area of a brain and cell border. This symbol informs that as a result of the Transition our body from a solid will turn into the holographic. However, not completely formed broken strips specify that body transformation may not happen. Consequently, our Transition so far is in doubt and may not occur if we do not follow ETC instructions. Thus, ETC inform that the purpose of civilization today is to transfer from the individual consciousness of each of us with a small brain area (Fig. 1, left circle) to the united consciousness of all civilization with the vast brain area. (Fig. 1, right circle). A small brain area of the individual cell is shown as a dark circle in the center of the left circle (Fig. 1). In this pictogram the individual cell is represented. (Fig. 2). The brain area of a cell is shown in the centre by a small circle. The outer boundary is presented by the largest ring. It indicates that each of us has an individual consciousness. In contrast, ETC constantly live in the united consciousness. The beginning of pictogram’ reading is highlighted by wide boundary of the cell (Fig. 3, red arrows). Wide border means a big egoism and indifference to the fate of others, terrorism, wars, etc. For the Transition it is necessary to refine cell borders (Fig. 3, blue arrows), i.e. to show sympathy and compassion. All other place in the united cell of Earth civilization will be occupied by huge area of a brain. The whole field of the pictogram is divided: radius into separate segments, and also concentric circles. Concentric circles with equal intervals between them create a grid-scale. It allows determining the extension of a brain area depending on the number of people that unite consciousness. conformity of expansion rate of brain areas of united cells at the given stage for each of two ways, and required rate of expansion. The pictogram with the similar diagram already appeared on fields of England. Separate segments also characterized humanity’ level of consciousness. However, the pictogram was a three-dimensional – 3-D. The pictogram presents the structure of an individual cell. It consists of three blocks of the truncated pyramids of different heights (Fig. 4). The number three informs about three previous levels of consciousness of inorganic and organic nature, included into a cell of the human being. Each of three blocks contains 4 pyramids (fig. 4). The height of each pyramid shows certain level of consciousness. Thus, the smallest pyramid (Fig. 4, 1) represents the individual level of consciousness. The second highest pyramid (Fig. 4, 2) represents the unified consciousness of people. The third pyramid represents the unified consciousness of humanity (Fig. 4, 3). Three highest pyramids designate the boundary of the cell (Fig. 4, 4). The truncated tops of pyramids rest against the small polygon located in the centre (fig. 5). So the area of a brain of an individual cell is shown. The square bases of all pyramids underline the fourth level of consciousness of human being. The basis of the greatest pyramid is divided into small squares (Fig. 6) which represent the civilization of Earth consisting of 6.7 billion people. The similar image of mankind cell is shown on the pictogram which has been presented also in England on July 30, 1997. Let's return to the pictogram of 2010. 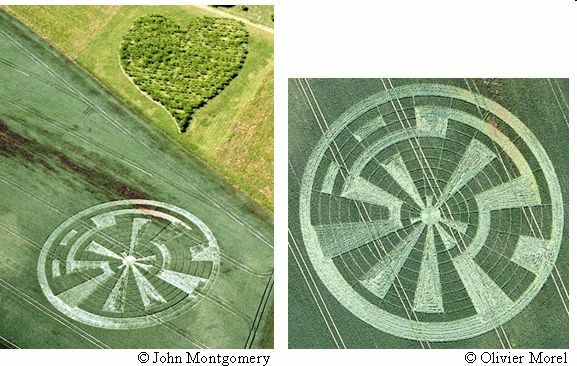 The crop circle shows two possible ways of the civilization, trying to form united consciousness. Two ways start with a big red and blue arrows (Fig. 7) clockwise and counterclockwise, respectively. Red arrows and white line show a way of not informed before the first pre-cataclysm mankind (Fig. 7). This way begins with the big red arrow, goes clockwise and contains three stages of consciousness expansion. The blue arrow and dark line present a way of already prepared mankind (Fig. 7). It contains only two stages of consciousness expansion. Stages are shown counter-clockwise. Hence, not informed civilization will require more time to unite consciousness than already humanity knowing about global cataclysms events. From the moment of the information receiving until unification of consciousness unaware civilization will need three stages. The prepared civilization begins already from the united consciousness marked on the picture by two blue arrows (Fig. 10). The advantage of informed humanity is that people already know the ultimate goal, work under already known scenario and are prepared for the united consciousness regime. The unprepared civilization should get acquainted with the information still. Therefore at the first stage in unprepared civilization immediately unite consciousness only a small number of people. In already prepared civilization immediately unites consciousness a huge quantity of people. In a short time after the first association all prepared civilization unites consciousness. In unprepared civilization for joining another large group of people is required a long time. Thus, this quantity of people is much less, than at the second stage of the prepared civilization. During the same time the prepared civilization will already completely unite consciousness. The information is transferred by alternating radial dark-light segments. Thus, segments with concentric stripes have a role of a scale grid showing levels of consciousness jumps (Fig. 8, dark arrow). Light segments (Fig. 8, yellow arrow) specify level of the united consciousness reached on the given stage. Thus, complete expansion of a segment from the centre to border means expansion of the individual cell brain area shown in the centre (Fig. 8, Fig. 9). Maximum expansion of brain area of civilization’ united consciousness cell is shown by a yellow arrow (Fig. 11). Two short yellow elements like dotted line marked by two blue arrows (Fig. 11) show the required maximum extension of a brain area of civilization’ united consciousness cell. Green arc shows the real level of a brain’ area expansion in the second stage of consciousness unification for unprepared civilization. It shows that at the second phase of consciousness association the required maximum of a brain area expansion has not been reached yet. For successful timely Transition the given expansion of a brain area in the second stage already should be reached. The red and blue segments (Fig. 12) show the jumps of brain area expansion under association of civilization’ consciousness. Expansion of a brain area means joining to consciousness association big quantity of people. Thus, red color corresponds to two jumps of consciousness in three stages of unprepared civilization. Blue color – to one jump of consciousness in two stages of already prepared civilization. Two extending segments marked by yellow arrows (Fig. 13), show the maximum required expansion of individual cell brain area from the centre to border. They also illustrate the law of the united consciousness: at unification of two individual cells one cell of the united consciousness with the expanded area of a brain appears. On the one hand, two segments demonstrate the law of the united consciousness, and, on the other hand, they show expansion of a brain area from individual consciousness to the united. Red segment on Fig. 14 is given for comparison. It shows level of a brain area expansion at second stage of unprepared civilization. Expansion of a brain area at first stage of the prepared civilization is shown by a green stripe. Two shortest segments (Fig. 15, red arrows), located near the centre and belonged to unprepared civilization, are shown far apart. They show the beginning and the end of entire process from the moment of receiving the information by a small amount of people till full association of consciousness for unaware civilization. However, the main thing that they represent individual consciousness of people not knowing about necessity of consciousness unification for continuation of life. Two longer segments belonged to prepared civilization are shown next to each other. They depict the principle of the united consciousness formation – unification of two individual cells – consciousness of two human beings – is formed a united cell with an expanded brain area. The segments indicate the beginning of the integration process and underline that humanity has already been prepared and big number of people immediately joined consciousness. The pictogram shows that ETC calculate all possible options that global cataclysms have not taken unawares civilization of Earth. Two levels of civilization’ consciousness are shown on Easter Island. Prepared and unprepared civilization demonstrate two types of moai statues. One type – idols without eyes, made of a grey tuff. Empty eye-sockets of idols show that they are blind. This way ETC have represented mankind before gaining knowledge about the existence of the Information world and the Transition. The second type – idols with red caps and eyes standing on Ahu-postaments. They represent already illuminated by knowledge prepared mankind. These moai have huge open eyes. These are not wandering in darkness of ignorance blind people, but confident in the future humanity. This type of humanity already knows about the information world and clearly sees the way. They understand that association of civilization’ consciousness and the Transition to other level of the material world is the only way for salvation from upcoming global cataclysms. Idol with a cap is a representation of human being on two levels of the Universe: a body of moai shows a human being in the material world level, red cap presents a cell of human being in the Information world. Red caps of several tons weight are made from red volcanic rock. Pupils of idols with hats are also made from red color which relate to information world. 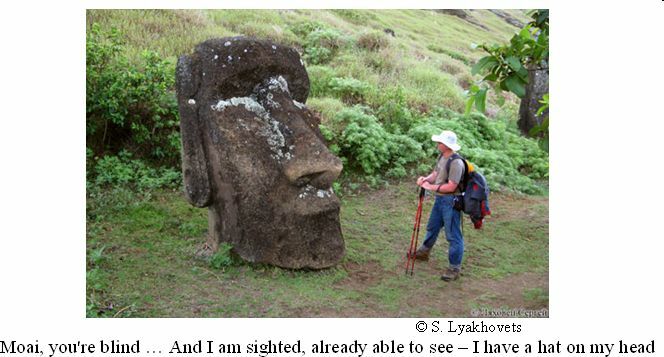 Eyes of moai are made of coral and obsidian. Moai with eyes have caps on head present information cells of individual and united consciousness. Thus, on Easter Island ETC have introduced a special method of color separation of objects from the material world and the Information world. By grey color ETC represented the material world. By red color they marked the Information world. From red tuff is also made the only idol in a kneeling pose named Tukuturi. It depicts the Information world which contains all this information major for mankind life. Kneeling pose of statue Tukuturi shows that mankind must obey ETC instructions and despite of everything make the Transition. If we do not realize the great importance of this information and will not make the Transition our civilization will be destroyed. This information is presented by the avenue of blind idols which is suddenly interrupted. Big ears of idols are intended to hear this information. Together with the message of inevitability of coming cataclysms, idol Tukuturi simultaneously transmits an exit from this critical situation as the Transition to another safe level of the material world, where global cataclysms do not happen. Carrying out this instruction idols stand by whole groups on platforms as if pending a synchronization signal. Moai on ahu-pedestals with red caps and red pupils of eyes show that for our Transition is necessary association of all people’ consciousness. This statement many times repeats a continuous dotted line consisting from ahu-pedestals with the idols standing one after another, creating a contour of Easter Island. It may seem strange, but moai for some reason do not stare into the boundless ocean, expecting the rare meetings with came to them strangers. 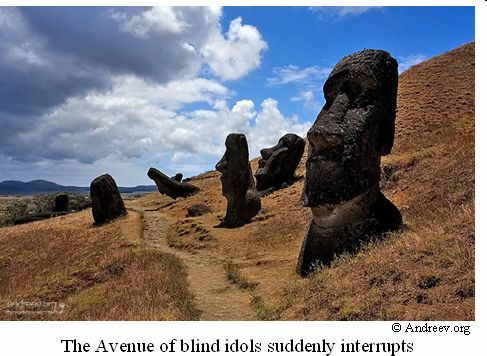 All idols gloomy and tensely look into the interior of the island… There, on top of the volcano Terevaka should be standing a huge 200-ton moai-giant of 20 meters height. He was supposed to represent a huge brain area of our civilization united consciousness cell. This giant would have been visible in the ocean from apart - like a lighthouse. 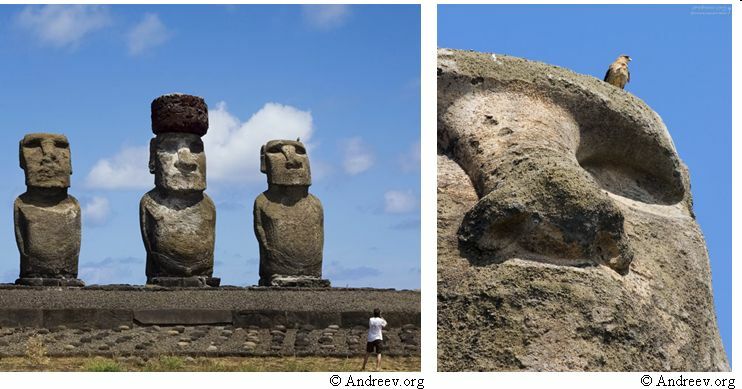 However, already completely created giant idol remained lying in a stone quarry… Its dreams of mankind association meanwhile have not come true … However it is already another different story about artificial created Easter Island-symbol of the humanity united consciousness which can be read in our book: «Despair of Easter Island Moai». All moai are legless. This feature of statues body was marked by famous Norwegian ethnographer Thor Heyerdahl notable for his legendary Kon-Tiki expedition. Thereby, ETC wanted to show that feet will not assistant mankind in coming emergency situation. Information complex of Easter Island clearly shows what a great danger posses misunderstanding of the situation due to critical decreasing of Earth magnetic field. Epilogue. By their messages through crop circles, Easter Island information complex and other objects of system of information transmission ETC try to awaken the sleeping civilization of Earth. ETC worry that mankind in a quiet serene sleep of ignorance can oversleep the future, and get into meat grinder of global cataclysms. ETC have arranged this pictogram near the planting in the form of heart. Heart in symbolic of ETC means association of two individual cells with the pointed oval of dematerialization (fig. 16). So by this pictogram ETC briefly show what it is necessary to do. The similar pictogram has already been presented on fields of England in 2000. By their messages through crop circles ETC try to awaken the sleeping civilization of Earth. ETC worry that mankind in a quiet serene sleep of ignorance can oversleep the future, and get into meat grinder of global cataclysms.